A recruiting poster for the Alliance for Catholic Education’s (ACE) first cohort suggested: “Tired of getting homework? Why not give some!” Twenty-two years later, ACE has found a home in California, especially in the area of STEM education. The Alliance for Catholic Education, founded in 1993 to sustain, strength, and transform Catholic schools in the United States, has a strong presence in California. Current ACE Teaching Fellows communities, housing 29 teachers, are in Sacramento, Oakland, San Jose, Los Angeles, and Santa Ana. Twenty-four current or former members of the Mary Ann Remick Leadership Program also currently serve as dynamic school leaders in California Catholic schools. Two current research projects involve long-term partnerships with California universities. A measurement study collaborating with UCLA researchers, sponsored by the National Science Foundation, is developing and testing a tablet-based portfolio system to capture elements of quality science teaching. A Spencer Foundation-sponsored study, in collaboration Stanford University researchers, is investigating whether, when, and how science teachers use evidence of student thinking to adapt their instruction. The Center is a partner with the award-winning science museum Discovery Cube and the Diocese of Orange Catholic Schools, and the University of Notre Dame Center for STEM Education. Fourth- and fifth-grade teachers in diocesan schools receive professional development classes and science teaching kits as well as taking their classes on a field trip to the museum. 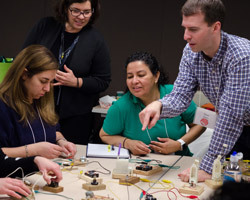 The Trustey Family STEM Teaching Fellows, an extended professional development program, holds a four-day RISE Summit each January in Palo Alto to introduce innovative models and tools for the classroom. The initiative, in its first year, has teams at schools in Dana Point, Santa Margarita, and San Francisco. Among the Center’s hands-on summer camps led by ACE graduates, two are in California cites – a two-week science and engineering camp and a two-week computer programming and robotics camp for middle school students. In partnership with local dioceses and Catholic schools, they have been held in Stockton, Modesto, and Santa Ana. For twenty-two years, the Alliance for Catholic Education has been ‘improvising on Providence’ as its founder, Father Tim Scully, C.S.C., says. A significant portion of that improvisation has drawn on the rich tradition of Catholic education in the state of California – and we are just getting started! Originally published by Matthew Kloser at provost.nd.edu on January 28, 2016.